Play is not always playful. You light a match and watch it burn. It is about enjoying the smallest, almost imaginary, danger. It can be about the transformative event, an experience shared amongst those present at one unique moment. Burning Black is a journey through the mysteries of fire. Working with memory and ritual, it draws the viewer into an ephemeral community. From those moments together, what do the flames destroy? What endures? Bring your past, your dreams, and together we'll forge the present. 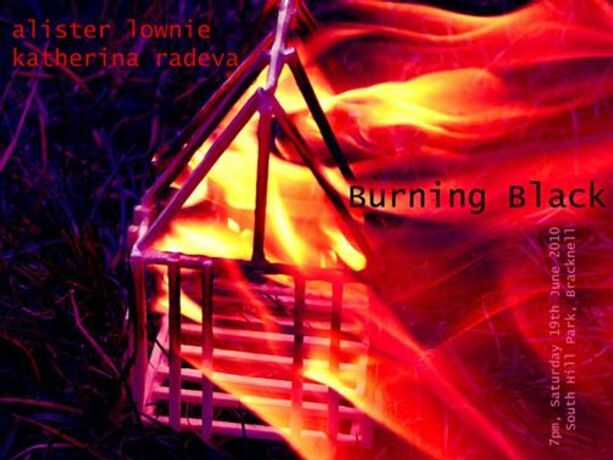 Katherina Radeva and Alister Lownie have been working together since October 2009, investigating community and memory. Working with installation and performance, they are the artists in residence for the At Play exhibition, devising this new work at South Hill Park. We would like to invite you to see the work in progress at 7pm on Saturday 19th June, in the Dance Studio at South Hill Park, and to discuss responses afterwards. Free, but please RSVP kat@katherinaradeva.co.uk as places are limited and will be on a first come first served basis.